While the character Aschenbach in the novella is an author, Visconti changed his profession from writer to composer. This allows the musical score, in particular the Adagietto from the Fifth Symphony by Gustav Mahler, which opens and closes the film, and sections from Mahler's Third Symphony, to represent Aschenbach's writing. Apart from this change, the film is relatively faithful to the book, but with added scenes where Aschenbach and a musician friend debate the degraded aesthetics of his music. While Aschenbach attempts to find peace and quiet, the rest of the city is gripped by a cholera epidemic, and the city authorities do not inform the holiday-makers of the problem for fear that they will leave. As Aschenbach and the other guests make day-trips into the city centre, they begin to realize that something is seriously wrong. Aschenbach decides to leave, but in a moment of impulse decides to stay. However, he himself is dying from heart disease. Rejuvenated by the presence of Tadzio—though they never actually converse—he visits the barber who, in his words, "returns to you merely what has been lost", dyeing his grey hair black and whitening his face and reddening his lips to try to make him look younger. As he leaves the barber's shop the barber exclaims: "And now Sir is ready to fall in love as soon as he pleases". Aschenbach continues to gaze at Tadzio from afar, the latter more aware that he is being gazed at. In the climactic scene, Aschenbach sees Tadzio being beaten up on the beach by an older boy. When released, Tadzio walks away from him alone towards the horizon. He suddenly turns back to look at Aschenbach, then turns away to face the sun, and stretches his arm out towards it. Aschenbach too, stretches his hand as if to reach Tadzio, and at that very moment—heightened by the crescendo in Mahler's Adagietto—he dies from a heart attack. A few people notice him collapsed on his chair and alert the hotel staff. They carry Aschenbach's body away. l.t.r. Visconti, Sergio Garfagnoli [it], Andresen. The film's score was performed by the Orchestra dell'Accademia de Santa Cecilia, conducted by Franco Mannino, and subsequently released by EMI. In addition to the music of Gustav Mahler's Third and Fifth Symphonies which embodied the character and suffering of Aschenbach, Visconti included a number of pieces from other composers. Although overshadowed as they are by the dominance of Mahler they play an important part in the film's narrative. One is the ballad by Armando Gil, sung by the strolling player, Chi con le donne vole aver fortuna (He who wants to be successful with the ladies). Another is Beethoven's famous piano piece Für Elise played by Claudio Gizzi. The third which is particularly evocative, is Modest Mussorgsky's Lullaby which in the film, heralds Ashenbach's death. It is sung by Mascia Predit, an unforgettable soprano whom Visconti was happily surprised to discover among the extras when filming the last scene. But misfortune has come, disaster upon disaster, . . . Your quiet slumber is guarded by God himself. In the second volume of his autobiography, Snakes and Ladders, Bogarde recounts how the film crew created his character's deathly white skin for the final scenes of the film, just as he dies. The makeup department tried various face paints and creams, none of which were satisfactory, as they smeared. When a suitable cream was found and the scenes were shot, Bogarde recalls that his face began to burn terribly. The tube of cream was found and written on the side was "Keep away from eyes and skin": the director had ignored this and had been testing it out, as small patches, on various members of the film crew, before finally having it applied to Bogarde's face. In another volume of his memoirs, An Orderly Man, Dirk Bogarde relates that, after the finished film was screened for them by Visconti in Los Angeles, the Warner Bros. executives wanted to write off the project, fearing it would be banned in the United States for obscenity because of its subject matter. They eventually relented when a gala premiere of Death in Venice was organized in London, with Elizabeth II and Princess Anne attending, to gather funds for the sinking Italian city. In 2003, Björn Andrésen gave an interview to The Guardian in which he expressed his dislike of the fame Death in Venice brought him and how he sought to distance himself from the objectifying image he acquired from playing Tadzio. He stated that he now disapproves of the film's subject matter: "Adult love for adolescents is something that I am against in principle. Emotionally perhaps, and intellectually, I am disturbed by it - because I have some insight into what this kind of love is about." He also recounted attending the film's premiere at the Cannes Film Festival: "I was just 16 and Visconti and the team took me to a gay nightclub. Almost all the crew were gay. The waiters at the club made me feel very uncomfortable. They looked at me uncompromisingly as if I was a nice meaty dish...it was the first of many such encounters." Death in Venice holds a 68% "fresh" rating at Rotten Tomatoes based on 19 reviews. Film historian Lawrence J. Quirk wrote, in his study, The Great Romantic Films (1974), "Some shots of Björn Andrésen, the Tadzio of the film, could be extracted from the frame and hung on the walls of the Louvre or the Vatican in Rome." He says Andrésen did not represent just a pretty youngster as an object of perverted lust, but that novelist Mann and director-screen writer Visconti intended him as a symbol of beauty in the realm of Michelangelo's David or Da Vinci's Mona Lisa, the beauty that moved Dante to "...seek ultimate aesthetic catharsis in the distant figure of Beatrice." In 2011, writer Will Aitken published Death in Venice: A Queer Film Classic, a critical analysis the film, as part of Arsenal Pulp Press's Queer Film Classics series. In July 2018, it was selected to be screened in the Venice Classics section at the 75th Venice International Film Festival. 1972, Nastro d'Argento: Best Director, Best Cinematography, Best Costume Design, Best Production Design. ^ Leftist Visconti Lives Right, But Not Under a Bridge Kramer, Carol. Chicago Tribune (1963-Current file) [Chicago, Ill] 11 July 1971: e1. ^ Matt Seaton (2003-10-16). "'I feel used': Bjorn Andresen - the beautiful Tadzio from Death in Venice, tells Matt Seaton why he is furious about being on the cover of Germaine Greer's new book". The Guardian. Retrieved 2018-05-18. ^ "Death in Venice". rottentomatoes.com. Retrieved 7 May 2018. 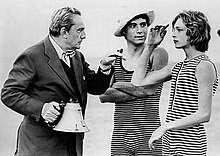 ^ Richard Burnett, "Montreal author Will Aitken revives Death in Venice". Xtra!, January 26, 2012. ^ a b "Festival de Cannes: Death in Venice". festival-cannes.com. Archived from the original on 2012-09-25. Retrieved 2009-04-12. ^ "The Official Goodies Rule - OK! Fan Club Website - Articles/Guides". www.goodiesruleok.com. Retrieved 7 May 2018. Henry Bacon, Visconti: explorations of beauty and decay. Cambridge: Cambridge University Press, 1998. Dirk Bogarde, Postillion Struck by Lightning. London: Orion Books, (new edition) 2006. Lawrence J. Quirk, The Great Romantic Films, New York: Citadel Press, 1983. This page was last edited on 13 April 2019, at 12:25 (UTC).